Busy mornings are better when I can grab a muffin from our homemade stash. As the pace of life quickens, however, it can be tricky to squeeze in time for baking. 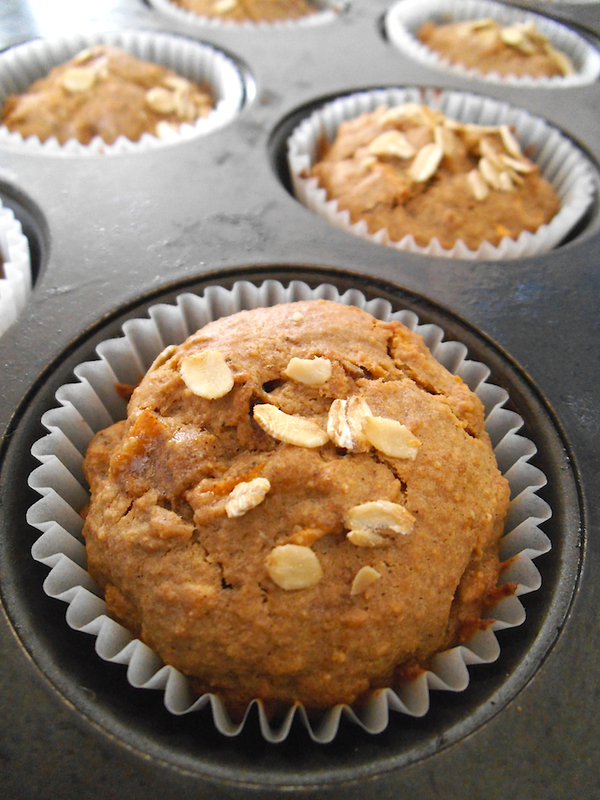 That’s one reason I love to make muffins–they go in and out of the oven faster than loaves. My oldest daughter is always hankering for fresh-baked goods, and I can more easily oblige now, thanks to my new muffin tins. I can also envision a basket of Sweet Potato Spice Muffins on our holiday table, or for brunch on a long weekend. What’s helpful about this recipe is that you can work with whatever ingredient options are easier for you to gather. So the first time I made these, I used grated raw sweet potato to save time. This week I tried them with mashed cooked sweet potato. 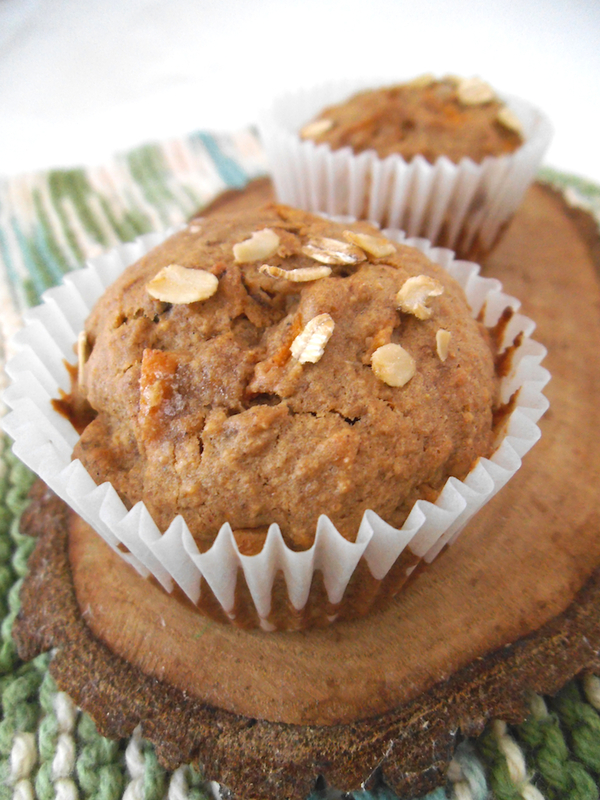 When you have leftover sweet potatoes, spiced muffins great way to reinvent them! Both versions are hearty and delicious, with just the right amount of warm spices accenting the orange goodness. And if you prefer to make this recipe in loaf form, it works just as well. I’ve been to numerous holiday events that featured loaves of homemade quick bread. Sweet Potato Spice Bread is another delicious option for sharing-in either muffin or loaf form. Take your pick and enjoy! *unbleached or whole wheat flour is also an option if you don’t require gluten-free ingredients. Preheat oven to 350 degrees F (180 C). Whisk together flours, baking powder, baking soda, spices, and salt. In a separate bowl, blend together oil, sugar, sweet potato, and eggs. Stir in applesauce. Fold in pecans and/or raisins, if using. Combine wet and dry mixtures, stirring well. You can also use an electric mixer for this. For loaves, pour batter into greased or parchment-lined loaf pans. To make muffins, pour batter into a greased muffin tin or tin with paper muffin liners. Sprinkle batter with oats and/or cinnamon sugar if desired. Bake muffins for 15 to 18 minutes or until centers test done. For loaves, bake 50 to 60 minutes, until center tests done and moist crumbs stick to a toothpick. Do not over bake. Let loaves cool before cutting (in order to minimize crumbling). Serve muffins or loaves on the same day as baking or wrap and store in the freezer to maintain freshness. I’m sharing in the goodness at Fiesta Friday this week. OHHHHH, YUMMM…..can hardly wait to have some with you soon. great for Thanksgiving and every day Thanksgiving as your Grandpa A. would often say. What a great idea! I love muffins too, and it is great to grab them and go 😀 Your muffins look delicious! Thank you for sharing them with us at Fiesta Friday! Got the baked sweet potatoes in the fridge, must try these!! Thank you, Julia! I’ve come to appreciate them more in recent years as well. Amazing recipe! I love all of the ingredients. They look so delicious – it doesn’t get better than MUFFINS! Do you know what I can sub for oat flour? I have quick oats (but no blender to turn them into oat flour). I also have spelt flour, almond flour, and coconut flour. Spelt flour should work just fine!